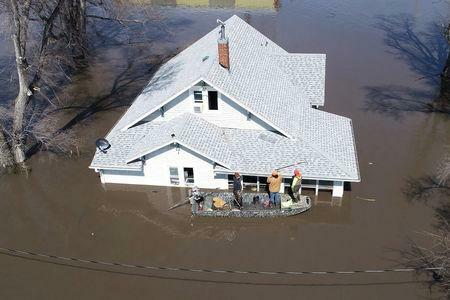 (Reuters) - At least one person was missing on Monday after devastating floods across the U.S. Midwest that killed three others and inflicted hundreds of millions of dollars in damage in what Nebraska's governor called a disaster of historic proportions. As floodwaters began to recede in much of the area inundated by the aftermath of a storm dubbed a "bomb cyclone," Nebraska officials were taking in the damage in a state where 64 of the 93 counties have declared emergencies. "This is clearly the most widespread disaster we have had in our state's history," in terms of sheer size, Governor Pete Ricketts told reporters on an afternoon briefing call.